Last Friday we shared a story about our friendly neighborhood peanut ghost. Nothing too odd or scary, just a little fun in our house. Whether it is supernatural or rodent, we like to share the story. However, today's story is less quirk and more unexplained. Let me preface this by saying that I don't particularly believe in ghosts or the supernatural and typically look for ways to explain away anything Wendy or I experience in the house. But it is Halloween, so why not share some of the things we've not been able to easily explain? The account of circumstances and events that follow are all first hand experiences that we've had in the house. Before we begin, lets take a step back in time. Wendy and I have done some research on the families that have lived in our house over the past 125 years and what we've found has been interesting and thought provoking. Over the years, our home has served as a rooming house, two apartments, a home for a single bachelor, a studio and home for an artist, and even a home for a family of as many as six people. But the most intriguing inhabitants were the original owner and her son. In 1886, Mrs. Caroline Bryan, recently widowed from her husband, George, moved from a block and a half away where she had lived in a grand and spacious home into the modest row house where we now live. 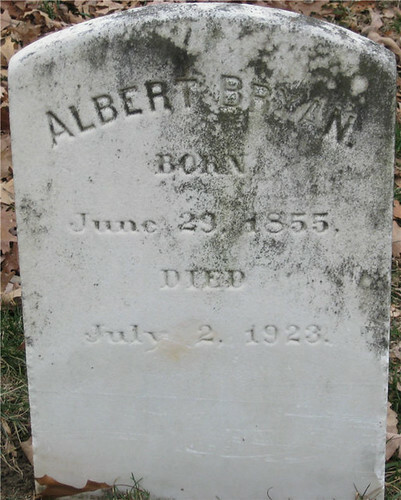 Mrs. Bryan, along with her youngest son, Albert, had fallen on hard times after her husband's death. She once lived in a fairly lavish setting with maids and a house staff, but was forced to leave her comfortable surroundings as the family fortune began to dwindle. We believe the widow Bryan and her son were the first owners of the home, rather than renters, but it is known that they were the first family to live in the home that played a significant transitional role in their life. 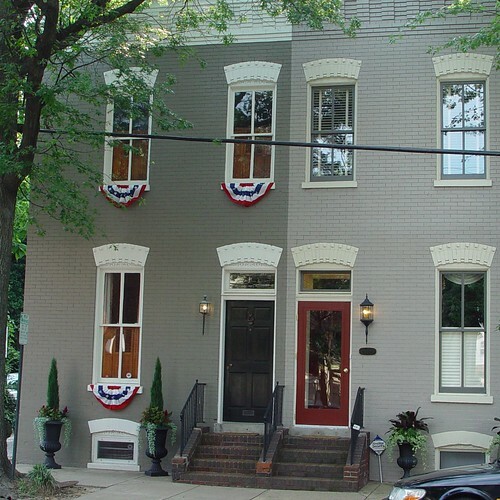 Throughout the years, the home's facade and interior, especially in the first several rooms, has remained in a similar configuration to what Mrs. Bryan knew as her home. Unfortunately, minor changes had been made along the way that have stripped several of the original details from the home. Who knows when door configurations were changed, hardware removed, molding damaged, and door knobs updated, but we do know they aren't what they were when the home was built and Mrs. Bryan moved in. If there is one thing we are doing on our renovation, it is trying to restore and replace the detail elements that bring just a little bit of originality and feel back to what the house may have been like circa 1886 when Mrs. Bryan moved in. Back in 2005 Wendy and I were settled in and working hard on our house. The previous summer our focus had turned to the home's exterior. A new neighbor's paint job and renovation had inspired us to replace our rotting siding and to paint the exterior. We were quite satisfied with the results and really felt like our home was coming along, but we had the issue of the unsightly front stairs. The brick behemoth stairs had adorned the front of our home for who knows how long, but they sure weren't original and didn't work with the period of the house. Wendy and I began talking seriously about replacing the stairs but really didn't know where to start, we just knew we loved cast iron stairs. At about this time, some strange things started happening inside the house. It all started rather innocuously. While sitting on the couch watching television, Wendy and I began to catch glimpses of movement out of the corner of our eye. This movement only ever appeared in the front two rooms of the house, the family room and dining room, and as soon as we would look, nothing would be there. We both chalked it up to simple figments of our imagination, but it seemed to be happening quite often, and it often happened in a manner that we would both actually see it at the same time. Then, one day in early spring, I was on one knee tying my shoelace before leaving for work when someone a foot or two behind me said "Wendy..." It was a clear voice, above a whisper but below normal talking level. For some reason I assumed it was Wendy saying her own name, so I pulled my laces tight and turned to say goodbye as I was leaving...but nobody was there. The voice of the person that I had heard so clearly belonged to no one. I went upstairs to find Wendy still sound asleep in bed with no explanation of where the voice had come from. We had our contractor, Fred Mashack, out to give us an estimate for the work. When he ballparked the job, Wendy nearly choked on her lunch and said "Thank you for your time." She had no intention of following through on the job. We were dejected, but she was right. We couldn't reasonably justify the cost, especially because the cost was doubled due to the fact that we would have to do the work along with our neighbors. We went on about our lives, occasionally bringing the project up, but always coming to the same conclusion, we just couldn't justify spending that much money. Several days later, Wendy and I were headed up to bed for the night. We went through our normal pre-bed routine which includes leaving most of the lights downstairs on. Why do we do this? Because we have a single button at the top of the stairs that turns off all of the lights on the first floor. Think of it as a "goodnight" switch. When you press the goodnight switch the lights on the first floor fade off over about one second, so you can still see downstairs while the lights dim. On this particular night I pressed the goodnight button and glanced downstairs to be sure the lights were turning off. This is a nightly ritual with expected results, except something was different this night. When I looked down the stairs I distinctly saw the shoulders, back, and leg of a female figure in a flowing black dress silently walking/gliding away from the bottom of the stairs to the right, away from the stairs and into the dining room. This was roughly the location where I had heard the voice while tying my shoes. I was pretty sure my eyes were playing tricks on me, but it was distinct and convincing enough that I had to go downstairs to make sure someone wasn't walking around in our house. When I reached the dining room the space was dark. It felt cold, but not empty, like someone was there standing in the corner to the left of the fireplace. I pressed the button to turn on the lights, and as they fade on as they fade off when I press the goodnight button, the room felt empty again. When the lights came up something caught my eye though. 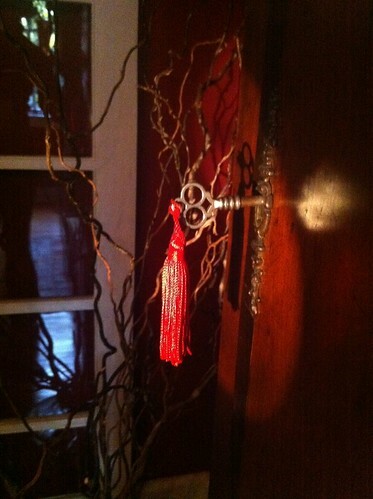 The red tassel hanging from the key in the door of the grandfather clock was swinging as if someone had brushed against it. The air conditioning was not running, the windows were all closed, and the swinging tassel stopped moving about five second later. I stood silently for several more minutes, waiting for the tassel to begin swinging again from a breeze I possibly hadn't noticed, but nothing, it was still. I went back upstairs, turned out the lights, and let Wendy know what I had just seen but was unable to explain why or how it had happened. During the next week or two after the swinging tassel, things around our house started to malfunction unexpectedly. Individually these were technology annoyances or just plain inconvenient, but together they seemed to be more than just coincidence. Over the span of about three weeks we had three hard drive failures, including one that failed within 10 minutes of install, lights in our house lost their programming and started turning on and off randomly or when switches in other rooms were activated, primary batteries for two of our computer battery backups died and needed to be replaced, our DVD player stopped turning on, one of the digital inputs on our television went black and never came back, and we had a malfunction of one of our security system sensors. And then the plumbing issues started. It was just a string of problems that we had never experienced in our house, and haven't experienced since. And, they affected multiple systems. If it were only electrical or even on one circuit, we could chalk it up to a singular electrical problem, surge, etc. Our final event in this little tale occurred during the night. I had a series of very vivid dreams involving our house and a Victorian woman who I felt like was Mrs. Bryan. She never introduced herself, but was dressed in a high neck and simple flowing floor length dress. In the first dream I had an ordinary view of her in an unknown setting, possibly our house, where she was sitting in a chair. She was relaxed and talking to someone, but not to me. Towards the end of the dream, she turned her attention to me and said, "You're doing a good job, keep working, you're both doing it right." 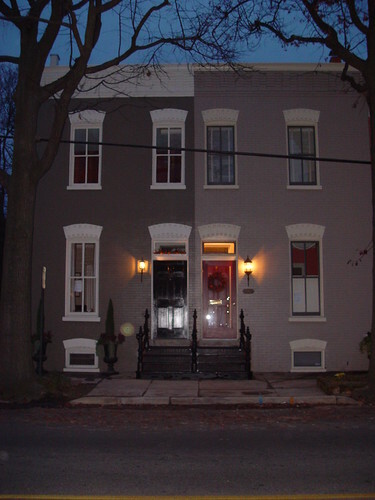 The second dream had Mrs. Bryan interacting directly with me, showing me our house during the 1880s, how the alley to the left of the house used to pass all of the way through to the next street, how the house was unpainted brick, and how the front steps of the house were once cast iron. She wasn't showing me photos, but was showing me images that let me see the details. Figment of my imagination or not, it was a real treat to experience a dream like the one I had. The final dream of the series was the most shocking. It was a brief dream without a setting with only an actor. The Victorian woman whom I assumed was Mrs. Bryan was back again and talking to me in a firm voice. She said, "Get up...you have to get up! It's open...GET UP!" I woke up suddenly and got out of bed. I had no idea what she was talking about, but I felt like I needed to listen and to get up. Wendy was still asleep but beginning to wake up. I told her what had happened and ventured off into the house. When I reached the first floor I could see exactly what Mrs. Bryan was talking about, and what it was that was open. Our basement is our wood shop/storage area/laundry area. It is dirty, has many dangerous items, and quite a few dark corners that Mel loves to sneak into and hide. Not to mention Wendy is always paranoid about things like Mel "inspecting" the furnace when it kicks on, or Mel sneaking through the crawl space into our neighbor's house. For this reason, as soon as the basement door is open I can usually see Mel lurking, trying to sneak his way downstairs. And for this same reason, he is absolutely forbidden to go into the basement. If he actually makes it down, he will undoubtedly emerge with blackened dirty paws. In this case, when I walked through the dining room and reached the basement door I saw that it was open by about 10 inches, Mel sitting in front of the door, looking down the stairs, but not venturing down as he always does. I distinctly remember fully closing and making sure the door was properly latched the night before. How it had come open during the night is a mystery, and how my dream hinted that the door was open, another mystery, and why Mel's paws were clean and he hadn't ventured down into the basement, a little bit creepy. When I got back upstairs I told Wendy about the dreams and about the basement door being open. She was a little weirded out (ok, maybe a lot), and wanted to know as much as I remembered. Over the next week we continued to have discussions about the front stairs and if perhaps we should just go for it. We also spoke with our neighbors, who had completed their own major renovation, and they were receptive to splitting up the cost. It was the perfect storm of homeowners who were interested in making a significant investment improve a major detail element of the homes, and throwing caution to the wind (on our part) and spending way more than we were comfortable spending. After we made the decision, Wendy had a one way conversation with Mrs. Bryan while sitting in the dining room of our home. She said something to the effect of "Mrs. Bryan, we're going to go ahead with replacing the front stairs with the cast iron stairs we've been talking about. However, they're very expensive, and if you want us to go ahead with this project, we're going to need you to stop breaking things in our home. If you keep breaking things, we're not going to be able to afford the project or to continue our renovation efforts. I promise we love this house and will care for it for many years to come, and I promise we're going to 'do it right'." After Wendy had the conversation with Mrs. Bryan, the problems immediately stopped. We went ahead with the cast iron stair project and after several months of debate and effort, including proposals to the Board of Architectural Review for approval, much demolition, and several very big checks, we were the proud owners of historically accurate salvaged case iron stairs that could have easily been on the house when it was new in 1886. The night we finished up the install we took this photo from across the street. We were proud of what we had accomplished and couldn't wait to share the photos with friends who had been aware of the saga. When transfered the photo from the camera to the computer and opened it up, this is what we saw. Do you see the small glowing ball immediately to the left of our door and the stairs? What do you think of the orb? Spec of dust? Maybe a bug? Perhaps Mrs. Bryan, checking out the finished work? All I know is that the orb isn't there in the previous photo, and it isn't there in the next photo we took. I hope you've enjoyed this tale of the unexplained this Halloween. If our haunting is in fact Mrs. Bryan, and her interest is in taking care of this home, we're quite all right with this ghostly inhabitant. After all, our interests are aligned. We've had a few other things happen over the years, but we'll save those for another time. Until then, we hope you have a Happy Halloween and enjoy your spooky evening. And, if you'd like to share your thoughts on our spirit guest, we'd love to hear your take on it. wow, that was worth the wait! Have you tried asking Mrs. Bryan what's up with the peanuts? Thanks, Lisa! Glad you enjoyed it, and that you felt like it was worth the wait :-) We haven't asked her about the peanuts, maybe her son liked them. wow - chills down my spine. That's pretty creepy... but, at the same time, so neat about what you dreamt. Have your neighbours experienced anything odd? Yes, one of our neighbors more than others. This neighbor has two kids a few years apart. Independently, during a certain age, they both would talk to a "woman in white." As they got older they stopped talking to and seeing her, but they both did it during a specific window of time in their childhood, completely independently of one another. I might have to get their full story for next Halloween. I don't (objectively) believe in ghosts or hauntings either, but your story is pretty damn convincing! 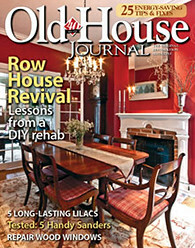 I think it was in the magazine Old House Journal, several years ago, that a number of old house owners wrote of their experiences with previous, but long-since-dead, owners/inhabitants of their homes -- again, like you, not coming from people predisposed to accept the supernatural interpretation of strange happenings. Personally, I think the inexplicable creaks and groans and movements in an old house -- as long as they're not too threatening of course! -- are yet another benefit we derive from deviating from cookie-cutter suburban living. Regardless of the existence or not, I really like it because of the story it adds that becomes a component of the fabric of the house. It's as much history as it is a real haunting. You are absolutely right, it is a true benefit. The peanut story was cute, but this gave me the chills! I love old houses but the history they come with can really be a bit spooky. We live in a Philly rowhouse c.1872 & have had our share of unexplained creaks, voices, footsteps and strange items under floorboards (namely, lots of bones)- especially when we first moved in and started tearing things apart. I've also come to believe our house has a witching hour - I've been unexplainably jolted out of bed at exactly 3am too many times to count. It's definitely a little unnerving if you think about it too much, but I guess it's part of the charm of living in an old house, as long as the ghosts are friendly. Kelly, your house is awesome! If haunts exist, Philly, with all of its history and age, is sure to have some, and I wouldn't doubt them in your super cool place. I do agree, friendly ghosts are a must, none of that poltergeist garbage is welcome in our place. This is FANTASTIC! Oh wow... Definitely creepy!! Again, I'd probably be crying if this happened to me, but to think that the original owner of the house approves of the restoration you've done, and even cares enough for you both to help you keep Mel safe! Oh how wonderful for you both! Fantastic story and well told. I wonder if you were able to check on the details of your dream to find out if the house did have an alley that went to the next street and pics of the original exterior of the house. Major creep factor if everything you dreamt was indeed true. I am fascinated by the dreams you had and with your experience. Thank you for sharing it! I hope you do write about your neighbor's experience with the women in white.